"Predator" and "prey" redirect here. For other uses of "predator", see Predator (disambiguation). For other uses of "prey", see Prey (disambiguation). Meat ants feeding on a cicada; some species can prey on individuals of far greater size, particularly when working cooperatively. In an ecosystem, predation is a biological interaction where a predator (an organism that is hunting) feeds on its prey (the organism that is attacked). Predators may or may not kill their prey prior to feeding on them, but the act of predation often results in the death of the prey and the eventual absorption of the prey's tissue through consumption. Thus predation is often, though not always, carnivory. Other categories of consumption are herbivory (eating parts of plants), fungivory (eating parts of fungi), and detritivory (the consumption of dead organic material (detritus)). All these consumption categories fall under the rubric of consumer-resource systems. It can often be difficult to separate various types of feeding behaviors. For example, some parasitic species prey on a host organism and then lay their eggs on it for their offspring to feed on it while it continues to live in or on its decaying corpse after it has died. The key characteristic of predation however is the predator's direct impact on the prey population. On the other hand, detritivores simply eat dead organic material arising from the decay of dead individuals and have no direct impact on the "donor" organism(s). Selective pressures imposed on one another often leads to an evolutionary arms race between prey and predator, resulting in various antipredator adaptations. Ways of classifying predation surveyed here include grouping by trophic level or diet, by specialization, and by the nature of the predator's interaction with prey. Classification of predators by the extent to which they feed on and interact with their prey is one way ecologists may wish to categorize the different types of predation. Instead of focusing on what they eat, this system classifies predators by the way in which they eat, and the general nature of the interaction between predator and prey species. Two factors are considered here: How close the predator and prey are (in the latter two cases the term prey may be replaced with host) and whether or not the prey are directly killed by the predator is considered, with true predation and parasitoidism involving certain death. 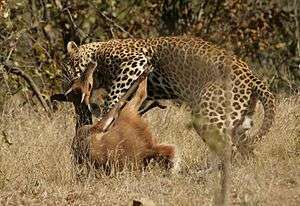 Leopard (Panthera pardus pardus) killing a young bushbuck (Tragelaphus sylvaticus) in Kruger National Park. A true predator can commonly be known as one that kills and eats another living thing. Whereas other types of predator all harm their prey in some way, this form kills them. Predators may hunt actively for prey in pursuit predation, or sit and wait for prey to approach within striking distance, as in ambush predators. Some predators kill large prey and dismember or chew it prior to eating it, such as a jaguar or a human; others may eat their (usually much smaller) prey whole, as does a bottlenose dolphin swallowing a fish, or a snake, duck or stork swallowing a frog. Some animals that kill both large and small prey for their size (domestic cats and dogs are prime examples) may do either depending upon the circumstances; either would devour a large insect whole but dismember a rabbit. Some predation entails venom that subdues a prey creature before the predator ingests the prey by killing, which the box jellyfish does, or disabling it, found in the behavior of the cone shell. In some cases, the venom, as in rattlesnakes and some spiders, contributes to the digestion of the prey item even before the predator begins eating. In other cases, the prey organism may die in the mouth or digestive system of the predator. Baleen whales, for example, eat millions of microscopic plankton at once, the prey being broken down well after entering the whale. Seed predation and egg predation are other forms of true predation, as seeds and eggs represent potential organisms. Predators of this classification need not eat prey entirely. For example, some predators cannot digest bones, while others can. Some may eat only part of an organism, as in grazing (see below), but still consistently cause its direct death. Grazing organisms may also kill their prey species, but this is seldom the case. While some herbivores like zooplankton live on unicellular phytoplankton and therefore, by the individualized nature of the organism, kill their prey, many only eat a small part of the plant. Grazing livestock may pull some grass out at the roots, but most is simply grazed upon, allowing the plant to regrow once again. Kelp is frequently grazed in subtidal kelp forests, but regrows at the base of the blade continuously to cope with browsing pressure. 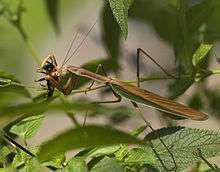 Animals may also be 'grazed' upon; female mosquitos land on hosts briefly to gain sufficient proteins for the development of their offspring. Starfish may be grazed on, being capable of regenerating lost arms. An opportunistic alligator swims with a deer. Among predators there is a large degree of specialization. Many predators specialize in hunting only one species of prey. Others are more opportunistic and will kill and eat almost anything (examples: humans, leopards, dogs and alligators). The specialists are usually particularly well suited to capturing their preferred prey. The prey in turn, are often equally suited to escape that predator. This is called an evolutionary arms race and tends to keep the populations of both species in equilibrium. Some predators specialize in certain classes of prey, not just single species. Some will switch to other prey (with varying degrees of success) when the preferred target is extremely scarce, and they may also resort to scavenging or a herbivorous diet if possible. A secondary consumer in action: a mantis (Tenodera aridifolia) eating a bee. Predators are often another organism's prey, and likewise prey are often predators. Though blue jays prey on insects, they may in turn be prey for cats and snakes, and snakes may be the prey of hawks. One way of classifying predators is by trophic level. Organisms that feed on autotrophs, the producers of the trophic pyramid, are known as herbivores or primary consumers; those that feed on heterotrophs such as animals are known as secondary consumers. Secondary consumers are a type of carnivore, but there are also tertiary consumers eating these carnivores, quartary consumers eating them, and so forth. Because only a fraction of energy is passed on to the next level, this hierarchy of predation must end somewhere, and very seldom goes higher than five or six levels, and may go only as high as three trophic levels (for example, a lion that preys upon large herbivores such as wildebeest, which in turn eat grasses). A predator at the top of any food chain (that is, one that is preyed upon by no organism) is called an apex predator; examples include the orca, sperm whale, anaconda, Komodo dragon, tiger, lion, tiger shark, Nile crocodile, and most eagles and owls—and even omnivorous humans and grizzly bears. An apex predator in one environment may not retain this position as a top predator if introduced to another habitat, such as a dog among alligators, a skunk in the presence of the great horned owl immune to skunk spray, or a snapping turtle among jaguars; a predatory species introduced into an area where it faces no predators, such as a domestic cat or a dog in some insular environments, can become an apex predator by default. Many organisms (of which humans are prime examples) eat from multiple levels of the food chain and, thus, make this classification problematic. A carnivore may eat both secondary and tertiary consumers, and its prey may itself be difficult to classify for similar reasons. Organisms showing both carnivory and herbivory are known as omnivores. Even herbivores such as the giant panda may supplement their diet with meat. Scavenging of carrion provides a significant part of the diet of some of the most fearsome predators. Carnivorous plants would be very difficult to fit into this classification, producing their own food but also digesting anything that they may trap. Organisms that eat detritivores or parasites would also be difficult to classify by such a scheme. The elimination of wolves from Yellowstone National Park had profound impacts on the trophic pyramid. Without predation, herbivores began to over-graze many woody browse species, affecting the area's plant populations. In addition, wolves often kept animals from grazing in riparian areas, which protected beavers from having their food sources encroached upon. The removal of wolves had a direct effect on beaver populations, as their habitat became territory for grazing. Furthermore, predation keeps hydrological features such as creeks and streams in normal working order. Increased browsing on willows and conifers along Blacktail Creek due to a lack of predation caused channel incision because they helped slow the water down and hold the soil in place. The act of predation can be broken down into a maximum of four stages: Detection of prey, attack, capture and finally consumption. The relationship between predator and prey is one that is typically beneficial to the predator, and detrimental to the prey species. Sometimes, however, predation has indirect benefits to the prey species, though the individuals preyed upon themselves do not benefit. This means that, at each applicable stage, predator and prey species are in an evolutionary arms race to maximize their respective abilities to obtain food or avoid being eaten. This interaction has resulted in a vast array of adaptations in both groups. 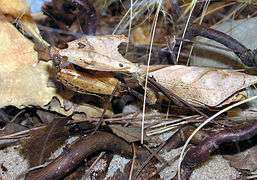 One adaptation helping both predators and prey avoid detection is camouflage, a form of crypsis where species have an appearance that helps them blend into the background. Camouflage consists of not only color but also shape and pattern. The background upon which the organism is seen can be both its environment (e.g., the praying mantis to the right resembling dead leaves) or other organisms (e.g., zebras' stripes blend in with each other in a herd, making it difficult for lions to focus on a single target). The more convincing camouflage is, the more likely it is that the organism will go unseen. Mimicry is a related phenomenon where an organism has a similar appearance to another species. One such example is the drone fly, which looks a lot like a bee, yet is completely harmless as it cannot sting at all. Another example of batesian mimicry is the io moth, (Automeris io), which has markings on its wings that resemble an owl's eyes. When an insectivorous predator disturbs the moth, it reveals its hind wings, temporarily startling the predator and giving it time to escape. Predators may also use mimicry to lure their prey, however. Female fireflies of the genus Photuris, for example, copy the light signals of other species, thereby attracting male fireflies, which are then captured and eaten (see aggressive mimicry). While successful predation results in a gain of energy, hunting invariably involves energetic costs as well. When hunger is not an issue, in general most predators will not seek to attack prey since the costs outweigh the benefits. For instance, a large predatory fish like a shark that is well fed in an aquarium will typically ignore the smaller fish swimming around it (while the prey fish take advantage of the fact that the apex predator is apparently uninterested). Surplus killing represents a deviation from this type of behaviour. The treatment of consumption in terms of cost-benefit analysis is known as optimal foraging theory, and has been quite successful in the study of animal behavior. Some adaptations of successful predators include speed- built for speed, weapons- sharp teeth and claws, camouflage- to avoid being seen by prey, and depth perception- eyes to the front of the head to judge size and distance. Social predation allows predators to kill creatures larger than those that members of the species could overpower singly. Lions, hyenas, wolves, dholes, African wild dogs, and piranhas can kill large herbivores that single animals of the same species usually don't dispatch. Social predation allows some animals to organize hunts of creatures that would easily escape a single predator; thus chimpanzees can prey upon colobus monkeys, and Harris's hawks can cut off all possible escapes for a doomed rabbit. Social predation is often complex behavior, and not all social creatures perform it. Even without complex intelligence, some ant species can destroy much larger creatures. 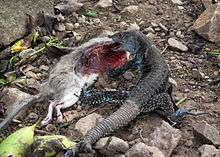 Size-selective predation involves predators preferring prey of a certain size. Large prey may prove troublesome for a predator, while small prey might prove hard to find and in any case provide less of a reward. This has led to a correlation between the size of predators and their prey. Size may also act as a refuge for large prey, for example adult elephants are, in general, safe from predation by lions, but juveniles are vulnerable. Many antipredator adaptations have evolved in prey populations due to the selective pressures of predation over long periods of time. Some species mob predators cooperatively. 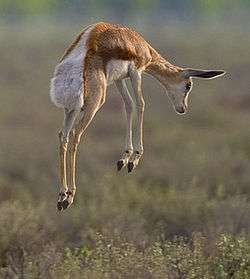 Others such as Thomson's gazelle stot to signal to predators such as cheetahs that they will have an unprofitable chase. Many prey animals are aposematically colored or patterned as a warning to predators that they are distasteful or able to defend themselves. Such distastefulness or toxicity is brought about by chemical defenses, found in a wide range of prey, especially insects, but the skunk is a dramatic mammalian example. The population dynamics of predator–prey interactions can be modelled using the Lotka–Volterra equations. These provide a mathematical model for the cycling of predator and prey populations. Predators tend to select young, weak, and ill individuals. Humans are to some extent predatory, fishing, hunting and trapping animals using weapons and tools. 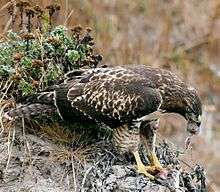 They also use other predatory species, such as dogs, cormorants, and falcons to catch prey for food or for sport. In biological pest control, predators from a pest's natural range are introduced to control populations, at the risk of causing unforeseen problems. Besides their use in conservation biology, predators are also important for controlling pests in agriculture. Natural predators are an environmentally friendly and sustainable way of reducing damage to crops, and are one alternative to the use of chemical agents such as pesticides. 1 2 Begon, M., Townsend, C., Harper, J. (1996). Ecology: Individuals, populations and communities (Third edition). Blackwell Science, London. ISBN 0-86542-845-X, ISBN 0-632-03801-2, ISBN 0-632-04393-8. ↑ Getz, W (2011). "Biomass transformation webs provide a unified approach to consumer–resource modelling". Ecology Letters. 14: 113–124. doi:10.1111/j.1461-0248.2010.01566.x. PMC 3032891 . PMID 21199247. ↑ Godfray, H.C.J. (1994). Parasitoids: Behavioral and Evolutionary Ecology. Princeton University Press, Princeton. ISBN 0-691-03325-0, ISBN 0-691-00047-6. P. 20. ↑ Feener, Jr., Donald H.; Brian V. Brown (January 1997). "Diptera as Parasitoids". Annual Review of Entomology. 42 (1): 73–97. doi:10.1146/annurev.ento.42.1.73. PMID 15012308. Retrieved 2009-03-04. ↑ Dawkins, R. (1976). The Selfish Gene. Oxford University Press. ISBN 0-19-286092-5. ↑ Fedriani J. M.; Fuller T. K.; Sauvajot R. M.; York E. C. (2000). "Competition and intraguild predation among three sympatric carnivores". Oecologia. 125 (2): 258–270. doi:10.1007/s004420000448. PMID 24595837. ↑ Botkin, D. and E. Keller (2003). Enrivonmental Science: Earth as a living planet. John Wiley & Sons. ISBN 0-471-38914-5. P.2. 1 2 William J. Ripple and Robert L. Beschta. "Wolves and the Ecology of Fear: Can Predation Risk Structure Ecosystems?" 2004. 1 2 Alcock, John (1998). Animal Behavior: An Evolutionary Approach (6th ed.). Sunderland, Mass. : Sinauer Associates. ISBN 0-87893-009-4. ↑ Bondavalli C.; Ulanowicz R.E. (1999). "Unexpected effects of predators upon their prey: The case of the American alligator". Ecosystems. 2: 49–63. doi:10.1007/s100219900057. ↑ Dawkins, R. (2004). The Ancestor's Tale. Boston: Houghton Mifflin. ISBN 0-618-00583-8. ↑ Lloyd J.E. (1965). "Aggressive Mimicry in Photuris: Firefly Femmes Fatales". Science. 149 (3684): 653–654. doi:10.1126/science.149.3684.653. ↑ Phelan, Jay. What is Life? A Guide to Biology. New York. W.H. Freeman & Company. 2015. Text. 1 2 Molles, Manuel C., Jr. (2002). Ecology: Concepts and Applications (International ed.). New York: The McGraw-Hill Companies, Inc. ISBN 0-07-112252-4. ↑ Caro T. M. (1986). "The functions of stotting in Thomson's gazelles: Some tests of the predictions". Animal Behaviour. 34 (3): 663–684. doi:10.1016/S0003-3472(86)80052-5. ↑ Bowers, M. D., Irene L. Brown, and Darryl Wheye. "Bird Predation as a Selective Agent in a Butterfly Population." Evolution 39.1 (1985): 93-103. ↑ Conner, W.E. (2009). Tiger Moths and Woolly Bears—behaviour, ecology, and evolution of the Arctiidae. New York: Oxford University Press. pp. 1–10. ↑ Genovart, M; Negre, N; Tavecchia, G; Bistuer, A; Parpal, L; Oro, D (2010). "The young, the weak and the sick: evidence of natural selection by predation". PLOS ONE. 5 (3): e9774. doi:10.1371/journal.pone.0009774. PMC 2841644 . PMID 20333305. ↑ Grant, S. W. F.; Knoll, A. H.; Germs, G. J. B. (1991). "Probable Calcified Metaphytes in the Latest Proterozoic Nama Group, Namibia: Origin, Diagenesis, and Implications". Journal of Paleontology. JSTOR. 65 (1): 1–18. JSTOR 1305691. PMID 11538648. ↑ McNamara, K.J. (20 December 1996). "Dating the Origin of Animals". Science. 274 (5295): 1993–1997. Bibcode:1996Sci...274.1993M. doi:10.1126/science.274.5295.1993f. Retrieved 2008-06-28. ↑ Awramik, S.M. (19 November 1971). "Precambrian columnar stromatolite diversity: Reflection of metazoan appearance" (abstract). Science. 174 (4011): 825–827. doi:10.1126/science.174.4011.825. PMID 17759393. Retrieved 2007-12-01. ↑ Stanley (2008). "Predation defeats competition on the seafloor" (extract). Paleobiology. 34 (1): 1–21. doi:10.1666/07026.1. ↑ Gabriel, Otto; Andres von Brandt (2005). Fish catching methods of the world. Blackwell. ISBN 0-85238-280-4. ↑ Griffin, Emma (2008). Blood Sport: Hunting in Britain Since 1066. Yale University Press. ↑ Richard J. King (1 October 2013). The Devil's Cormorant: A Natural History. University of New Hampshire Press. pp. 9–. ISBN 978-1-61168-225-0. ↑ Glasier, Phillip (1998). Falconry and Hawking. Batsford. ISBN 978-0713484076. Look up predate, pre-date, or predation in Wiktionary, the free dictionary.